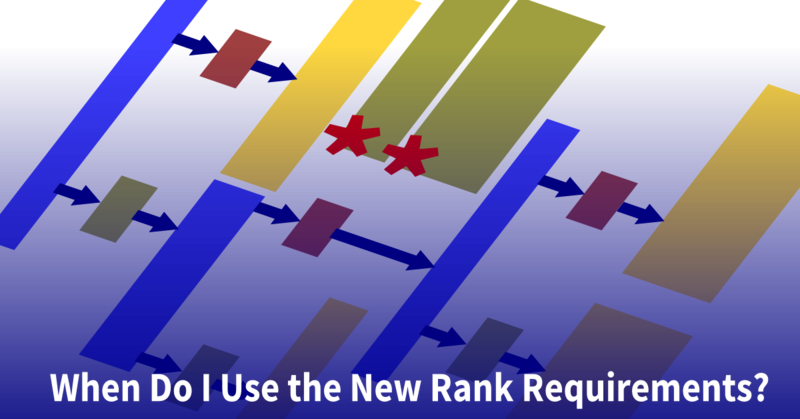 This is is fourth in a series of posts abut the new rank requirements that take effect on January 1, 2016. 1b. Explain each of the principles of Tread Lightly! Tell how you practiced them on a campout or outing different from the Tenderfoot requirement 1c and Second Class requirement 1b campout or outing. 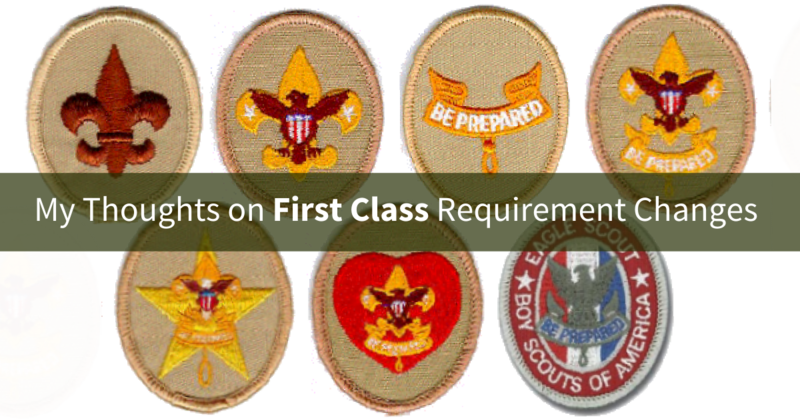 A new requirement that follows the emphasis on outdoor ethics in Scout through First Class ranks. If you have read the other posts reviewing the new requirements I am sounding like a broken record, but, honestly, how many times do you have to read the second half of that tortured sentence and flip pages back and forth before you understand it? It’s not that difficult to write clearly (see the “how I would do it” section below. This was “Cooking and Tools” in Second class, confused? Imagine how a Scout would feel. Why was “patrol” dropped in the new requirement? What is the difference between meals that are cooked and meas that aren’t? Is it the application of heat? Please explain why this is an important distinction. What does “help plan a menu” mean exactly? Only change here was changing “tell” to “show”. Only change here was changing “explain” to “demonstrate”. 2e. On one campout, serve as cook. Supervise your assistant(s) in using a stove or building a cooking fire. Prepare the breakfast, lunch, and dinner planned in First Class requirement 2a. Supervise the clean-up. Dropped “Lead your patrol in saying grace at the meals and supervise cleanup.” from the previous requirement. Adds specifics for types of evidence, otherwise unchanged. 5d Describe extreme weather conditions you might encounter in the outdoors in your local geographic area. Discuss how you would determine ahead of time the potential risk of these types of weather dangers, alternative planning considerations to avoid such risks, and how you would prepare for and respond to those weather conditions. 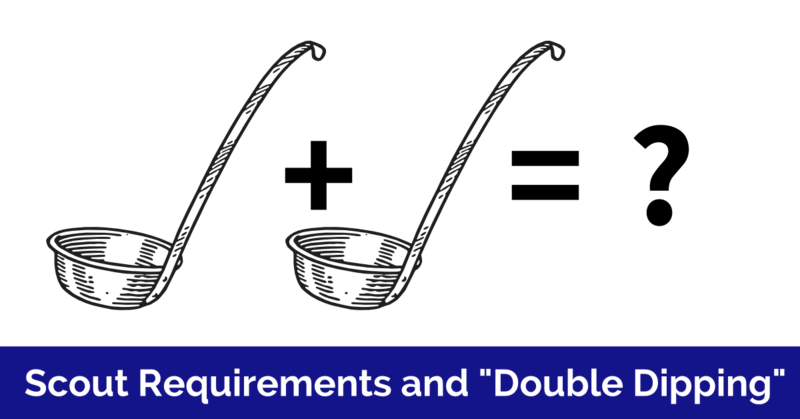 Three new requirements, a welcome addition from my point of view. This is really a core camping skill. Three new requirements aimed at increasing preparedness, a good set of skills. 6d. Describe proper body positioning in a watercraft, depending on the type and size of the vessel. Explain the importance of proper position. Two new requirements that enhance the safety afloat basics. Two new requirements that follow the emphasis on fitness in Scout through First Class ranks. 9a. Visit and discuss with a selected individual approved by your leader (for example, an elected official, judge, attorney, civil servant, principal, teacher) your constitutional rights and obligations as a U.S. citizen. Three new requirements. 9d follows the emphasis on community service in Scout to First Class ranks. 9b and 9c are okay, but they aren’t really in grounded in life of the patrol as well as they could be. I don’t think Scout age boys will find them particularly compelling or interesting, something that would be easy to do if the approach was altered slightly (see “how I would do it” below). No change, and a distressingly missed opportunity to expand on leadership (see “how I would do it” below). Addition of – “Tell how you have done your duty to God”. 11. While working toward the second Class rank, and after completing Second Class requirement 11, participate in a Scoutmaster conference. I can’t figure out the logic of this change. Can anyone explain it to me? Since joining, participate in a total of ten separate troop/patrol activities. You can count the activities applied to the Tenderfoot and Second Class requirements towards the total of ten. Six must include overnight camping. You must have stayed in a tent or shelter you set up in at least five of the ten overnight camping activities. *To qualify this activity you must spend the night in a tent that you pitch or other structure that you help set up (such as a lean-to, snow cave, or tepee). Explain each of the principles of Tread Lightly! Tell how you practiced these principles on a campout or outing that was not applied to Tenderfoot or Second Class Rank. The menu you plan needs to written down. Include at least one breakfast, one lunch, and one dinner. At least two of the meals you plan should require assembling ingredients and cooking them over a fire or stove. Discuss how the menu includes the foods from MyPlate or the current USDA nutritional model and how it meets nutritional needs for the planned activity or campout. Get the ingredients for your menu. Make a shopping list of ingredients to prepare your menu. Show how you determined what amount of each ingredient required for the menu. Prepare to cook the menu. Make a list of the pans, utensils, and other gear needed to cook and serve your menu. Using a stove or building a cooking fire. Prepare the breakfast, lunch, and dinner. Serving the meals to your patrol. Explain how to properly dispose of camp garbage, cans, plastic containers, and other rubbish. Discuss when lashings should be used, and when they should not be used. Demonstrate tying the timber hitch. Demonstrate tying the clove hitch. Complete an orienteering course that is a minimum of one mile in length. Use a map and compass to follow the course. During the course demonstrate how to measure the height and/or width of at least two features (A tree, tower, canyon, ditch or other feature) shown on a map. Demonstrate how to navigate using the Global Positioning System. Select a destination at least 500 yards from your current location. Determine the route you will take to get to your destination. Follow that route to arrive at your destination. Identify or show evidence of at least 10 kinds of native plants found in the area you live or camp. Explain why weather forecasts are important when planning for an event. Get a weather forecast from two different sources for an upcoming event. Discuss the potential danger of these three hazardous weather conditions. Discuss how to determine the potential risk of these types of weather dangers ahead of time. Discuss how to plan to avoid such risks. Discuss how to prepare for these types of weather conditions. Demonstrate the appropriate actions to take during these types of weather conditions. Demonstrate bandaging a sprained ankle. Demonstrate bandaging injuries on the head. Demonstrate bandaging injuries to the upper arm. Demonstrate bandaging injuries to the collarbone. Demonstrate how to safely transport a person from a smoke-filled by yourself. Demonstrate how to safely transport a person from a smoke-filled with a partner. Demonstrate how to safely transport a person with a sprained ankle for at least 25 yards by yourself. Demonstrate how to safely transport a person with a sprained ankle for at least 25 yards with a partner. Describe the five most common signals of a heart attack. Explain the steps (procedures) in cardiopulmonary resuscitation (CPR). Describe what utility services exist in your home or meeting place. Explain potential hazards associated with these utilities. Explain how to respond in emergency situations involving these utilities. Identify the basic parts of a canoe, kayak, or other boat. Identify the parts of a paddle or an oar. Describe proper body positioning in a watercraft, depending on the type and size of the vessel. Explain the importance of proper body positioning in a watercraft. With a helper and a practice victim who is approximately 30 feet from shore in deep water. Demonstrate a line rescue as a tender. Demonstrate a line rescue as a rescuer. You must complete the Tenderfoot and Second Class fitness requirements before you begin. During a four week period record how you are active for at least 30 minutes for five out of seven days each week. Show your records, and explain the challenges and successes you encountered during the four week fitness challenge. Set a goal for physical activity as part of your daily life. Explain how you are planning to meet that goal. Discuss your constitutional rights as a U.S. citizen. Discuss your constitutional obligations as a U.S. citizen. Choose an environmental issue affecting your community. Investigate the issue and gather three different articles, videos, or recorded discussions that relate to the issue. Develop a plan for action you, your patrol, and your community can take to effect the issue. Lead your patrol in a project or action effecting this issue. Make a list of the trash and garbage that is left over after the outing. Using this information plan how you can reduce, recycle, or repurpose the trash and garbage during a second, similar, outing. On the second outing apply your plan, make a list of the trash and garbage you reduce, recycle, or repurpose. Discuss a comparison of the results between the first and second outing. Participate in a total of three hours of service to others. The three hours must be completed at events or projects other than those used to fulfil the service requirements for Tenderfoot and Second Class. The three hours can be completed in one or more events or projects. 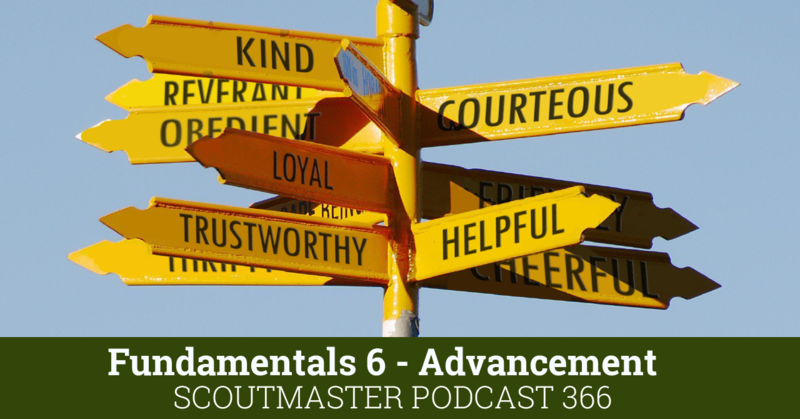 Explain how your service to others relates to the Scout Law. Explain how you helped your patrol plan a camping trip, patrol meeting, or other activity. Explain how you helped your fellow Scouts so they have fun and get the most out of what you have planned. Tell someone who is eligible to join Boy Scouts, or an inactive Boy Scout, about your Scouting activities. Invite him to an outing, activity, service project, or meeting. Tell him how to join, or encourage the inactive Boy Scout to become active. 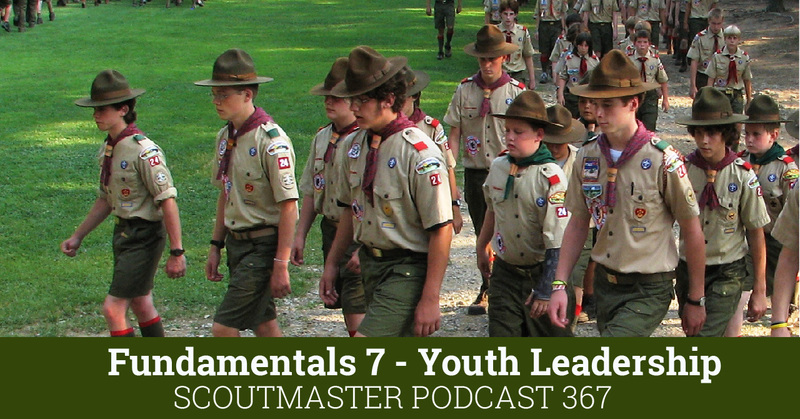 Share your efforts with your Scoutmaster or other adult leader. Explain how you have done your duty to God. 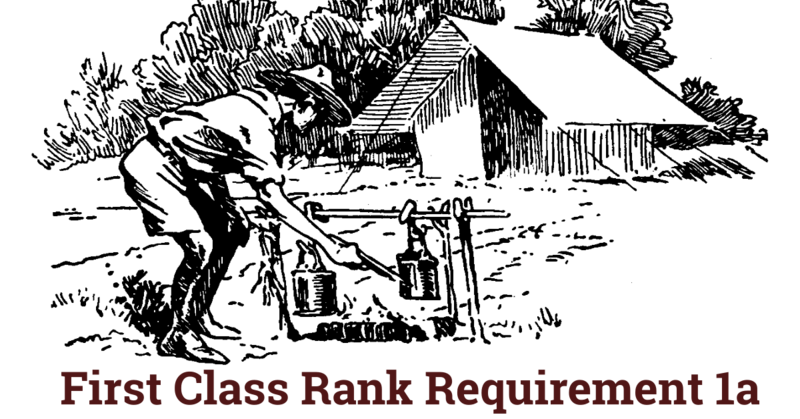 Choose four points of the Scout Law different from those you chose for Tenderfoot or Second Class. Explain how you have lived these four points of the Scout law in your everyday life. The Scoutmaster conference can be conducted any time after you have completed the Scoutmaster conferences for Tenderfoot and Second Class. During the Scoutmaster conference you will not be re-tested on the requirements you completed. You will be asked to discuss your experiences with your patrol and troop. Someday, the BSA will include earthquakes in their list of disasters. I’m beginning to think they just don’t include the west coast in their planning. At least this is consistent with E. Prep MB, which also leaves out earthquakes. b. Take part in at least one troop mobilization. Before the exercise, describe your part to your counselor. Afterward, conduct an “after-action” lesson, discussing what you learned during the exercise that required changes or adjustments to the plan. c. Prepare a personal emergency service pack for a mobilization call. d. Prepare a family emergency kit (suitcase or waterproof box) for use by your family in case an emergency evacuation is needed. Explain the needs and uses of the contents. I think this requirement covers the West Coast, as well as other areas of the U.S. that have disasters specific to their region. I think Jim’s right about reminding everyone that the unlike BoR, SM conference can take place any time, not just after completion of the other requirements. I’ve pointed this out many times, and I still doubt that more than one or two Scouts or adults understands it. I like your rephrasing of the requirements; they’re much clearer (but then, you weren’t part of a committee 😉 ). I do see what they were getting at. I’m can’t argue with moving some of the requirements forward a rank as they have, or with increasing the camping nights required. But on the whole, when I look at these, they seem like they would encourage, if not almost require, adults to do more of the signing off of requirements. (Particularly the new Fitness, Citizenship, and emergency prep requirements). “Successfully complete your board of review…” What does unsuccessful look like? It’s not a test, it’s a checkpoint. I don’t understand where the bar is set here. I’ll assume (HOPE) there will be changes to the program guide that will explain some of these changes. Some make sense, but other items don’t.